As an era­surist, I feel I need to account more for my sources than I do for my poems. First, I spend an obscene amount of time inputting odd com­bi­na­tions of search terms in sites like HathiTrust and archive.org: “tem­po­rary wharf lodg­ing,” “fall­out shel­ters,” “butcher­ing,” “mimes.” I’ll spend hours hunt­ing down just the right source texts, ones with unique vocab­u­lary and inter­est­ing syn­tax. Late­ly, I’ve also been seek­ing out sources where illus­tra­tions accom­pa­ny the text, adding anoth­er lay­er of con­text and inter­pre­ta­tion. 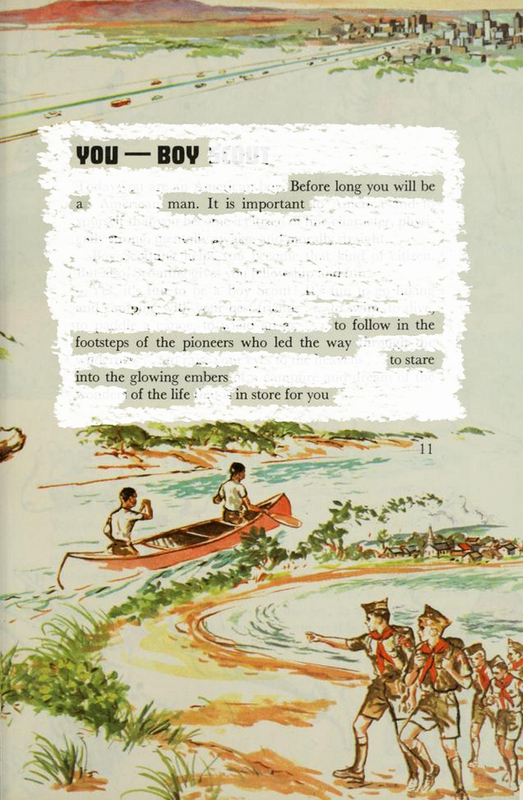 “You—Boy” and “Kind” are part of a larg­er series of pieces sourced from the 1965 Boy Scouts of Amer­i­ca Hand­book. As soon as I unearthed this text dur­ing my search, it was impos­si­ble to ignore. In addi­tion to invok­ing a sense of Amer­i­can nos­tal­gia, the hand­book is beau­ti­ful and filled with col­or­ful, retro graph­ics. The graph­ics, like the mes­sages in the text, are a weird sort of earnest, cheer­ful­ly unaware of their abil­i­ty to brain­wash unas­sum­ing boys into a sin­gu­lar vision of what it means to be a man. My pieces manip­u­late these out­looks into alter­nate depic­tions of what it’s real­ly like to be an adult. 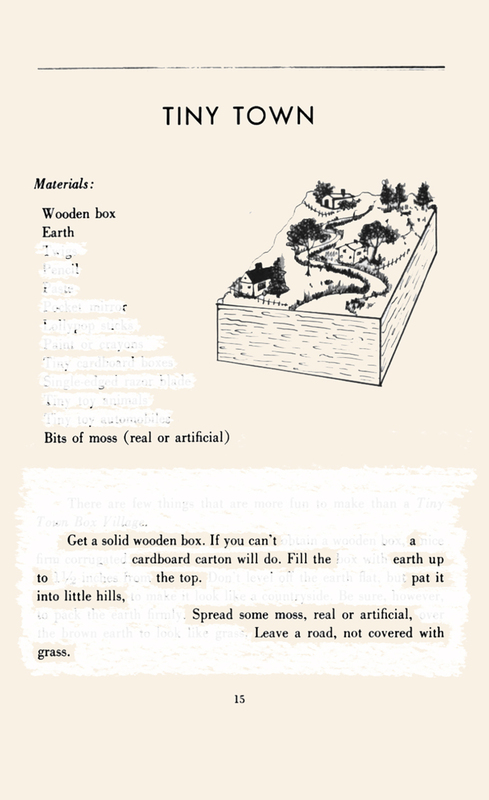 “Tiny Town” comes from a 1951 book, The Boy’s Hand­book of Play Ideas and Things-to-Do by Car­o­line Horowitz. Each page con­tains an activ­i­ty idea accom­pa­nied by an illus­tra­tion, a list of required mate­ri­als, and a set of direc­tions. 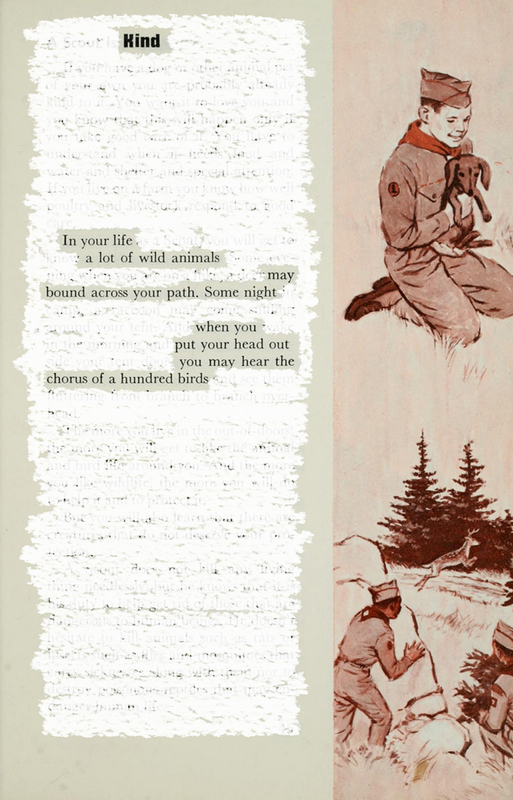 Sim­i­lar to the Boy Scout pieces, this piece takes a text orig­i­nal­ly meant for chil­dren and turns it into some­thing much more adult. Instead of a tiny town, the child crafts a bur­ial box. What ele­ments from our child­hood do we bury as adults? Jen­ni B. Bak­er is the founder and edi­tor-in-chief of The Found Poet­ry Review. Her poetry—mostly found, some not—has been pub­lished in more than three dozen jour­nals and pub­li­ca­tions. Her Oulipo-gen­er­at­ed chap­book, Comings/Goings, was released by Danc­ing Girl Press in March 2015. Always a fan of a good project, she is cur­rent­ly cre­at­ing era­sure poet­ry from David Fos­ter Wallace’s 1079-page nov­el Infi­nite Jest, one page at a time, at http://www.erasinginfinite.com.